A proof of concept evaluation of the electroencephalophone as a discriminator between wakefulness and general anaesthesia. Glen, J., Porr, B., Hamilton, R., Tait, L. (2013) British Journal of Anaesthesia. Test if you can distinguish between awake and anaesthetised. What we do is simple: we record an EEG and then play it back 48 times faster. Obviously we cannot speed up the brain so we just repeat the EEG while the new EEG data slowly updates our repeates. Imagine a TV program is repeated over and over again and every repeat a minute from the beginning is taken away and a new minute is added to the end. 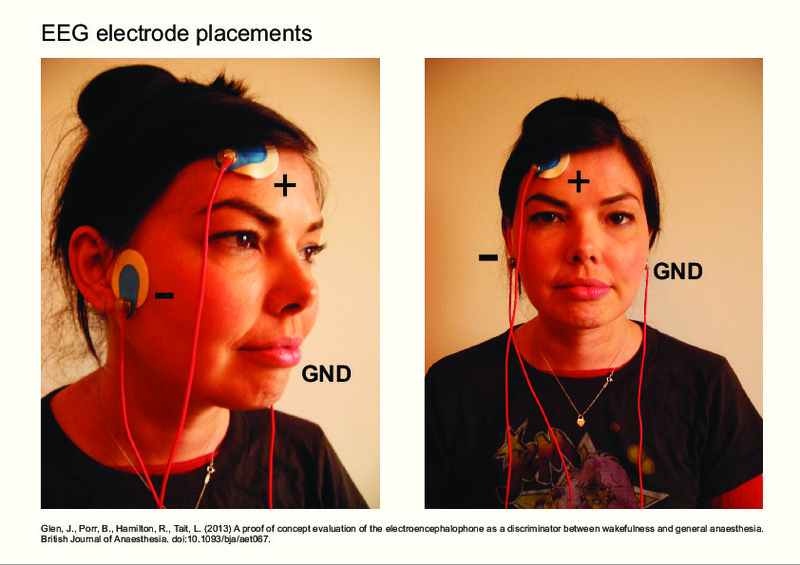 The photo above shows the actual locations of the two active electrodes. Check out this PDF or image to see all three electrode locations in greater detail. We used standard ECG electrodes for our recordings which produced excellent results. The design files of the EEG amplifier are open source and it is described here.